I love the colors of fall. 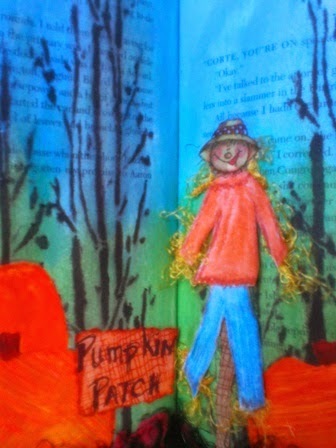 I love pumpkins, jack-o-lanterns, colorful leaves and the return of cool air. I love fall. I also love spring... but I love fall. The trees on this page are a Club Scrap stencil that Robin gave me. The pumpkins were cut with a Sizzix die. The ground cover is two different fibers woven together and glued down with Aileen's Tacky glue. The Scarecrow's head is a sticker. I made his body out of scraps and used fiber for his straw. The sign is stamped with a Just For Fun weave stamp and Archival ink. The background is blue Liquitex paint and green craft paint. Did I mention that I love the colors of fall in Tennessee??? You always think of the neatest things to do Boo - wonderful! Hey Boo, this one is burning!!! Looks very hot (couldn´t say cool, could I) in this book! Fabulous pages Boo. 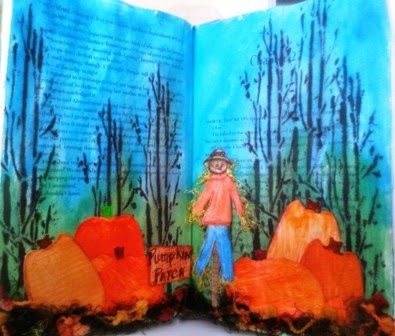 I love a good pumpkin patch! I always wish I could visit America at this time of year to visit one for myself! So very "scary" ;) Thanks so much for joining our first challenge at Rubber Dance Stamps!